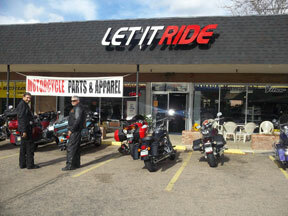 Let it Ride is a knowledgeable, energetic motorcycle parts and apparel shop that brings back the fun, local shop “feel”. We provide that personal touch that all great shops should have. You’re always greeted with a friendly hello and thanked sincerely for your patronage. This isn’t just our business, it’s our passion, our lifestyle! Located on the north side of Colfax at Carr St., right next to Wendy's.